There was work to be done. After all, when Jesus came, the twelve came with Him. The house needed to be swept. Food would have to be prepared and the table set. Twenty-six extra feet would require washing. Bedding, too, must be arranged, as traveling dinner guests always spend the night. If I don’t do it, she may have thought, it won’t get done. Housework and meal preparation were things no one else seemed to notice—unless they didn’t get done. Perhaps no one could remember a time when Martha didn’t get them done, and she was determined this day would be no exception. Both Martha and Mary loved and served Jesus. Yet one was a worker, the other a worshiper; one was a servant, the other a seeker. Together, they paint contrasting pictures of the Christian life. 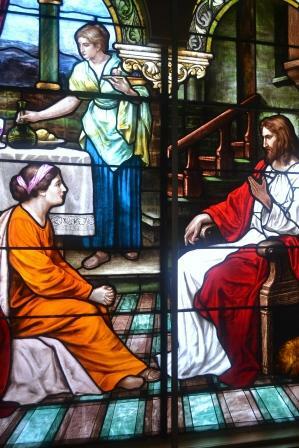 In Scripture’s account of that dinner, Martha is mentioned first (Luke 10:38-42). She was probably the eldest, certainly the one in charge of the home. Some speculate her family was prominent and wealthy. If so, she probably had several servants. She was a doer, a goal-oriented achiever, a believer in the work ethic who took pride in her accomplishments and thrived on success. Today, Martha would make a good executive, coach, committee chairman, or Christian worker. She is the “super homemaker” type—a compulsive cleaner and five-course meal server who wouldn’t be caught dead with dust on the refrigerator or frozen pizza in the oven. Martha was a classic example of what some physicians call the “type A” personality, those aggressively involved in an endless struggle to achieve, to accomplish more in less time. They see people as obstacles to their goals and have little tolerance for others’ deficiencies. Mary, on the other hand, was a “type B” personality. Patient and low-key, she was people-oriented. It’s likely she often got distracted from her work to engage in conversation, much to Martha’s annoyance. Mary may have depended heavily on an impatient Martha to do her jobs for her. Martha was the type who would hoe weeds; Mary was the type who would smell the flowers. Mary sat at Jesus’ feet and listened to every pearl that dropped from His mouth. It wasn’t every day that one could hear the Master, and she wasn’t about to miss this opportunity. Meanwhile, Luke tells us, Martha was “distracted by all the preparations that had to be made” (10:40 NIV). And a great deal did have to be done—all without vacuum, range, microwave, or even running water. Martha is not criticized for working hard to be a good hostess, rather, for being distracted by her serving. The word translated “distracted” means “to be drawn about in different directions.” We are not distracted to something, but away from something. She was distracted from Jesus. Being distracted is not always bad. One can be distracted from television, worry, eating, or even sin in general. Mary was distracted, too—from the housework. But more important, she was compelled to her Lord. Put yourself in Martha’s position. She had had it. Perhaps the bread had burned, the drinks had spilled, and the kitchen was a mess. No one else was bothered, but perfectionist Martha lived under the self-imposed pressure that made her endure such occasions rather than enjoy them. She prided herself in serving dinner on time, and it was already late. Meanwhile, every time she breezed past the front room, her eyes focused on her sister Mary, blissfully seated at the feet of Jesus. It’s not that listening to Jesus was wrong, of course. Martha would do the same if time permitted. But it didn’t, or so she told herself. To Martha, Mary’s behavior was sheer laziness and the height of insensitivity. Unfortunately, her own insensitivity in not spending time with Jesus never dawned on her. Having put up with this situation for more than long enough, Martha marched into the front room, to the amazement of her guests. The Greek words used in verse 40 imply suddenness or haste. In essence, Martha accused not only her sister but also Christ of insensitivity and injustice. Here is the Messiah, the Savior, God incarnate—not the kind of person to whom one barks out orders. But Martha lost sight of whom she was dealing with. She allowed Jesus’ lordship to be eclipsed by her own grievances. She was a lot like Peter—energetic, strong-willed, and ready to give advice, even to her Lord. When she should have been quietly listening to Him, she was loudly challenging Him. Those same attributes that made Martha a capable, effective manager also got her in trouble. She was aggressive, assertive, and strong in conviction. She was also quick to criticize, intolerant of others’ differences, and prone to self-pity. Maybe Martha was jealous of Mary’s close relationship with Jesus. Yet she could have been just as close had she chosen to spend the time with Him. She should have calmly taken her concern to Mary. Instead, she disrupted the good fellowship of weary travelers and thoroughly embarrassed her well-meaning sister, not to mention herself. But in Jesus’ response, we learn as much about Him as we do about Martha. He knew her heart. She did love Him and was sincerely doing her best to serve Him. She just didn’t realize she was serving her own pride. She attempted to minister to him when she desperately needed to be ministered by Him. John 11:5 states, “Jesus loved Martha and her sister and Lazarus.” With amazing wisdom and tenderness, Jesus here demonstrates that love by not rebuking Martha’s insolence. Instead, the Lord gently puts the whole scene in perspective for her. “Martha, Martha,” He begins, as one often did in addressing one he deeply loved and longed to lead in a better way. We can imagine Jesus gently placing His hands on her shoulder, as He continues: “You are worried and upset about many things, but only one thing is needed. Mary has chosen what is better, and it will not be taken away from her” (Luke 10:41, 42). The word translated “worry” comes from the Greek words for “pieces” and “mind.” Literally, it means to come to pieces in the mind or to have a divided mind. Jesus admits there is no end to the number of things we might worry about (Matt. 6:34). We can worry about our jobs, our possessions, our children, our health, or, like Martha, our responsibilities. Worry does not stem from these things, however, but from within. It’s the product of a mind that lacks perspective. Such a mind needs to fill itself from the reservoir of God’s Word, not the innumerable concerns that constantly vie for our attention. Martha quite likely knew the verse, “Be still, and know that I am God” (Psalm 46:10). Yet she seldom put it into practice. Mary chose “what is better” or, literally, “the better portion.” The reference is to food, and it sets up an interesting contrast. While Martha devoted herself to preparing physical food, Mary devoted herself to receiving spiritual food. She was a hungry soul, single-mindedly devoted to the spiritual meal served by Jesus and oblivious to all else. Jesus stresses the issue of Mary’s choice. Yet Martha also had a choice, even though she probably thought her hands were tied. I have to do this work, she rationalized. It’s not a matter of preference, but necessity. How many times do we use this as an excuse to neglect time with God? Charles Hummel’s The Tyranny of the Urgent reminds us we must learn to discern between the urgent and the truly important. Serving the guests was much more urgent than listening to Jesus. But it was also far less important. Mary made her choice; so did Martha. She was not the victim of circumstances. Couldn’t Martha have prepared a simpler meal or delayed dinner long enough to enjoy Jesus’ presence? If she had, she could have gone about her duties with renewed perspective and probably with the help of her sister. Jesus said of Mary, “It will not be taken from her.” Time spent at the feet of Jesus is an investment in eternity, a treasure stored in Heaven. The Westminster Confession states, “The chief end of man is to glorify God and enjoy Him forever.” Martha might have thought “enjoy” was a bit too frivolous. She suffered from job saturation. Today, we, too, are often managed by our responsibilities. Sometimes, when we are unsure of our direction, we attempt to compensate by doubling our speed. The result is a hurried and harried Christian life, full of activity, but devoid of an eternal perspective. In his marvelous book When I Relax I Feel Guilty, Tim Hansel describes Martha-like believers as “Weary Servants of the Impossible.” For us, there are never enough hours in the day or days in the week. Often, those most committed to serving others give of themselves until they have nothing left. But they keep on giving, drawing from a dry reservoir. They have forgotten how to receive. Martha, too, forgot there was one thing even more fundamental than giving to Jesus. That sounds almost heretical, doesn’t it? What could possibly be more important than giving to Jesus? Receiving from Him. The truth is, we need our Lord a great deal more than He needs us. Jesus wants our fellowship and devotion, not just our skills and efforts. He values our service less than our devotion and worship. Yet it is worship that fosters the most effective service. Martha is not rebuked for serving any more than Mary is commended for not serving. The message is not “worship precludes service,” but “worship precedes service.” I found when I was a pastor that grasping and maintaining this perspective on worship and service was the most important challenge in my ministry; it was also the most difficult. It’s too easy to base my sense of worth on what I do or how much I do, rather than who I am. Too often I cut short worship to devote more time to service. Ironically, whenever I put service before worship, I shortchange those I’m attempting to serve, and I shortchange myself. But worst of all, I shortchange my Lord. Satan’s favorite lie is, “There’s work to do. God understands. He’s always available, and there’ll be plenty of time to spend with Him later.” Hence, the urgent displaces the important. We allow the labor of our hands to overshadow the love of our hearts. Often, the urgent is what people want us to do. But the important is what God wants us to do. Jesus did not always live up to others’ expectations. But he was in touch with His Father and knew how to separate the grain of God’s will from the chaff of man’s will. At the end of His life, Jesus said to His Father, “I have brought you glory on earth by completing the work you gave me to do” (John 17:4). What strikes me is not that Jesus worked, or even that He finished His work, but that the work He finished was what God gave Him to do. When we’re asked to do worthless or unprofitable things, it doesn’t take much wisdom to say no, does it? Especially not when you do one of those things and think, “Okay, that was a waste…I’m never doing that again.” The real problem is all the good things we’re asked to do. The word translated “distracted” means “to be drawn about in different directions.” We are not distracted to something, but away from something. What Is Your Personal Quiet Time Like? Randy Alcorn answers the question, "What is your personal quiet time like?"